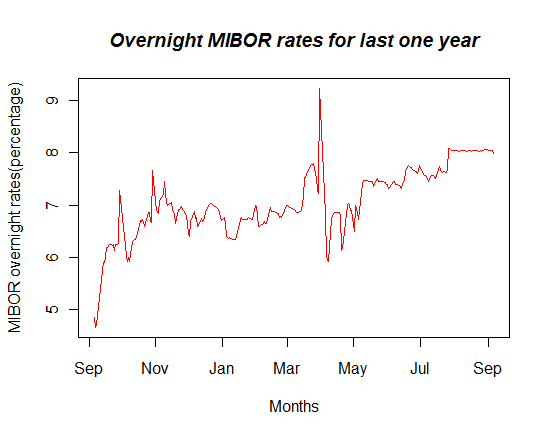 # The overnight MIBOR rates were stored in a file name "Call_Rates_2011.csv", this is just a normal Excel file saved in a CSV(comma separated delimited) format that R can read. # The way in which R conceptualizes the data is similar to that in Excel, to draw a simple analogy you can assume that the variable "a" now stores the entire Excel spreed sheet in it. 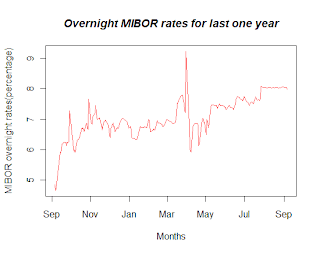 # You will have to make sure that the working directory is the one that contains the file "Call_Rates_2011.csv"
# The 2 column headers in my CSV file were "date" and "mibor", so the below code plots "date" on the x-axis and "mibor" on the y-axis. The as.Date() tells R that the column "date" contains dates in the format "day-month-year"('%d-%b-%y'). # a$(column header) is the standard way of referring to a column in the "spreadsheet" contained in "a"
Incase you can't make out the difference in the quality of the plot obtained just drop in your comments and email address and I will mail you the pdf and the jpg image of the plot. You can pull/stretch it to see that the pixels don't get distorted and it looks way neater if you present it in your slide in a presentation. I don't know why I have not found this blogspot earlier. Very detailed and clear explanations. By the way, are you on twitter, facebook, google+? P.S: I used the MIBOR .csv file you provided in one of your other tutorials. GUEYE, If you used the MIBOR.csv file provided by me in http://programming-r-pro-bro.blogspot.in/search/label/Principal%20component%20analysis this post, then you would get this error because that file contains "#NA". In the same post I have used the approx() function to replace these "#NA" with a linear interpolation. It should work now. Let me know if you still face any problem. Hi Shreyes, I got the same problem with my data. I tried your fix code but it pops the error: need at least two non-NA values to interpolate. Any idea? What is a[,2], and what is "$y" in the above example? Can/should the '%d-%b-%y' string be changed to the "%m/%d/%Y %H:%M" string if I'm using the as.POSIXlt example below? I am still beginning with R.
How to plot the graph using this data ? Also can R take huge CSV files, I have a CSV file, hwich has 10000 lines. Thanks Shreyes, I will try this. Also, Can R take large sets of CSV data ? I am a SAN engineer by profession and the performance data we get is huge. R does have a shortcoming of using the physical memory to create/dump its objects, having said that I don't think 10,000 rows of data should pose any problem. However, as the size of the data increases, say greater than 40-50Mb, depending on your machine it might start acting funny. Revolution R seems to have a package RevoScale that breaks the data into chunks and is proficient when it comes to dealing with large datasets, but that is as far as my knowledge goes about Rev R, I am trying to get familiar with Rev R and am not a pro at that. Thanks. I tried the script. though the graph got created, it is not very clear. X axis wasn't in the proper format. and Lines didn't come properly. Still it is good learning and I want to develop on this. Thanks a lot again, your input was really helpful. I have groups of record in my csv file. I want to create multiple graph in same window with different color for different groups. For Example, I have N1 record of group A at different timepoint and N2 for B at different time points. I want to have two graphs in same window with Red and green color. Is it possible? Is it possible to give the option “group by” in below example? I saw there are different kinds of graph but this method was very simple. Thanks in advance for your help. Hi, Could you please help plotting data like below ? i want to know count how many time nifty cross 8200 level i have csv file with me but i dont knw to put formula in R for that please anybody help me. I want to have a script that will plot one year followed by the other i.e. starts from Jan-Dec and continued from the next year. How to plot the log of one column versus another.